This product has ‘class’ stamped all over it. First of all we have Gutman, a cellist of great repute, accompanied by the Mahler Chamber Orchestra, from whom we have come to expect playing of great refinement. Overseeing all, we have Abbado, the venerable maestro known for producing performances of intelligence and integrity. The disc appears to have originated from the Italian wing of Universal Classics and Jazz, having been recorded in Italy. Accordingly the booklet notes are, somewhat unusually, printed first in Italian and then in English. The cover artwork reproduces the detail from Klimt’s ‘Die Musik’. The same image was used for Abbado’s Chicago recording of Mahler’s Seventh Symphony (Abbado-Mahler; do you see the connection?). It certainly looks rather beautiful, with all those dark greens, blues and browns being somewhat evocative of the music contained within. And then there is the programming. It is one of the great paradoxes of commercially recorded music that the consumer would find it desirable to buy a disc containing, for example, three Mozart concertos, or two Beethoven symphonies, or several Clementi sonatinas, when very few would actually want to attend a concert programmed thus. Praise to Deutsche Grammophon in this case for providing such a stimulating, unusual yet entirely logical coupling of two works that have not been as widely recorded as would perhaps be ideal. Schumann and Brahms knew each other, of course, and the works here were written at the end of the older man’s career and at the beginning of the younger’s. Schumann’s Cello Concerto has suffered neglect in comparison to his other concertante works. It is not a work to reveal its treasures in a single hearing and contains little of the free-wheeling joie de vivre of the piano concerto or the reckless virtuosity of the Konzerstück for four horns and orchestra. It is more introspective than either other work and, after a few hearings, Schumann’s typical vein of lyricism starts to become irresistible. Composed within an astonishingly brief two-week period shortly after Schumann’s move to Düsseldorf in 1850, the cello concerto represents one of his final attempts at a work in concertante form. By this time, the composer had already begun to suffer severe periods of depression but the new optimism generated by his leaving Dresden seems to inspired him to a final burst of creativity. Some commentators have identified the inward qualities of the concerto as being a result his unstable mental condition. That as may be, but the uninitiated should not take this to mean that the work is desperately dark and troubled. The opening Nicht zu schnell is really the only movement where darkness can in any sense be said to prevail. Certainly Natalie Gutman appears to see it so. Gutman’s dark, rich and yet admirably clear tone is ideally suited to this music. However, she comes dangerously close to distorting the shape of the music with excessive rubato. The first subject, for example, is pulled in all directions, not allowing a steady pulse to be established. Throughout, Gutman manipulates rhythms not only in the expressive lyrical passages but also in passage work. Other cellists have fallen foul of this music in such a way, notably Rostropovich and Maisky (both with Bernstein) and yet so compelling is Gutman’s performance that the results are still magnetic. Of course, with such flexibility from the soloist it remains with the orchestra and conductor to introduce some kind of stability. To say that Abbado and his forces do this magnificently is to risk sounding predictable. Needless to say, the Mahler Chamber Orchestra produce some lovely sounds and Abbado guides them through a performance of admirable clarity. 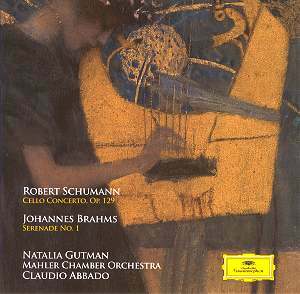 Abbado seems to possess the rare ability to elucidate Schumann’s orchestration like few others today, without sacrificing weight and body of sound. It does of course help that he is here working with a chamber orchestra, but just listening to his recording of the ‘Complete works for Piano and Orchestra’ with Perahia (Sony SK64577) confirms that he is able to exercise the same judgement with an orchestra of the size and pedigree of the Berlin Philharmonic. Gutman is, rather surprisingly, less indulgent in the central Langsam (which follows without a break; Schumann apparently disliked applause between movements). She really allows herself to sing in the great lied-like melodies, and the Mahler Chamber Orchestra once again produce some exquisite sounds (particularly the wind section). But it is in the concluding Sehr Lebhaft that the performance finally takes wing. There are fewer opportunities for rubato here, and both soloist and conductor collaborate to produce a performance of youthful enthusiasm and ardour, without ever driving the music too hard. Indeed, Gutman allows herself a little space here and there to draw out the humour of Schumann’s writing. By the end of the movement we are convinced that the cello concerto is not only neglected, but a neglected masterpiece. There can be no higher praise for a performance. Those wanting a more straightforward, less ‘sophisticated’ alternative would do well to track down Isserlis (RCA 09026 68800-2) or Wispelwey (Channel Classics CCS11097), but this performance is thoroughly recommendable if the coupling appeals. Abbado recorded Brahms’ Serenade No.1 with the Berlin Philharmonic over twenty years ago. Then, as now, he took a markedly pastoral view of the piece without losing sight of its more symphonic aspects. The Serenade had a complex gestation, Brahms originally composing it for octet and only later being persuaded to expand the instrumentation to chamber orchestra proportions. In it, the composer takes the ideals of the classical serenade, the genteel dances of polite society, and transforms them into something approaching symphonic sophistication. A large part of its success, therefore, is due to its eventual large-scale scoring. Right from the beginning of the large opening movement, Brahms is in rustic mode, making frequent use of bass ostinatos. Here, and particularly in the following scherzo we are reminded of, amongst others, Dvořák, in the folk-like inspiration of much of the material. Indeed, the ‘open-air’, fresh quality of the serenade as a whole would surely make new friends for the composer amongst those who find the fuller, more opulent textures of the symphonies a little too oppressive. Abbado appreciates these qualities, and also the fact that many of Brahms’ defining characteristics are also present here. His earlier BPO recording was highly successful, but the passage of time and the employment of a chamber orchestra have resulted in a reading superior on every level. The wind players of the BPO played their numerous solos beautifully, but their successors in the Mahler Chamber Orchestra need fear no comparison. The main gain is in the textural clarity of this new release. Abbado balances every strand, every piece of counterpoint to perfection; every phrase is perfectly judged, exquisitely nuanced. Some may find the music making on display here a little too refined, but there is no denying the quality of this new recording. Deutsche Grammophon’s recording of both works is not quite ideal; the sound can seem a little recessed, and Gutman is placed quite far in front of the orchestra in the concerto. Nevertheless, this is certainly a recommendable release, perfectly tailored for continuous listening. For those new to either work, it would make an ideal coupling. Others may want to investigate anyway, given the exceptional levels of artistic achievement.